This day is also commonly known as Nrusinh Chaturdashi. 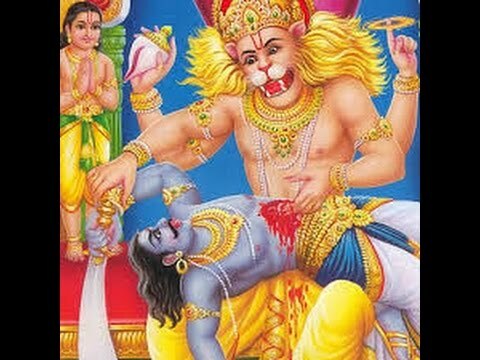 (Vaisakh Sud 14) which marks the divine appearance of Lord Nrusinh as (Half man (Nru) – Half Lion (Sinh)) to annihilate the demon King Hiranyakashipu and protect His Devotee Prahalad. Lord incarnated as Varah (a boar) and annihilated demon Hiranyaksh. This infuriated his bother Hiranyakashipu who vowed revenge upon Vishnu. He performed harsh penance to gain a boon of immortality from Bhrama; the creator. Bhrama though pleased with his penance was unable to grant this boon. Therefore Hiranyakashipu thus that may his death not occur by the hands of man, animal, Demi-God or demon. He may never die, neither indoors nor outdoors, neither during the day nor night, neither by weapons nor mantra (chants), and neither on earth nor sky thus being the supreme amongst all in the three worlds. After successfully receiving such a boon from Bhrama, Hiranyakashipu terrified the three worlds with his atrocities. In the demonic clan of Hiranyakashipu, his wife Kayadhu begot a devotee child named Prahalad who had gain divine knowledge of God in the womb when mother Kayadhu resided in Sage Narad Muni’s hermitage. Hiranyakashipu’s atrocities worsened as he forced everyone to worship himself as God and not Vishnu. At the age of five, Prahalad was sent to the demonic school where he was tutored by Shand and Amark, sons of Shukracharya (Guru of the demons) on the demonic ways of living. They jabbed him with spikes, used various kinds of weapons, attempted crushing him under wild rampaging elephants, poisoning through snakes, fed him poisonous food, threw him off a cliff and many other methods of killing. However, even after all such ordeals, he remained unharmed due to his staunch devotion and constant protection by Lord Vishnu.